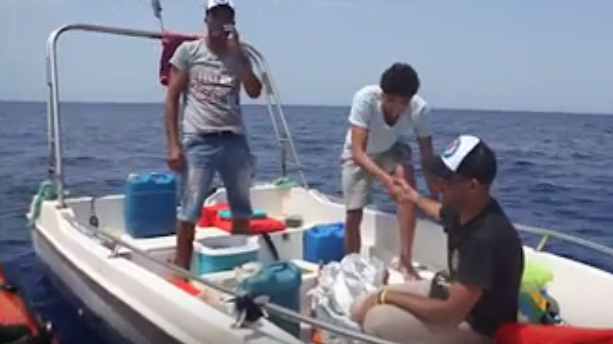 The migrants seen during their rescue. Updated 6.45pm - A migrant rescue boat, the Golfo Azurro, is currently just off the coast of Malta, awaiting instructions on where it can disembark three irregular migrants that it picked up off Libya. Unconfirmed reports say that the vessel picked the migrants off Libya and that Italy has not given permission for it to drop them off in Lampedusa, claiming that a new code of conduct for NGOs involved in such activities had not been observed. Marine traffic websites show the vessel as being 'at orders Sicily'. Malta is refusing entry to the vessel because its nearest port of call had been Lempedusa when the rescues were made. Some of the volunteers aboard were however brought to Malta on a launch to board pre-booked flights from here.